Nearly a million ultraviolet sources appear in this mosaic of the Large Magellanic Cloud, which was assembled from 2,200 images taken by Swift's Ultraviolet/Optical Telescope. Stitching together thousands of images, astronomers have created the most detailed ultraviolet light portraits of the Milky Way's two closest neighbors: the Large and Small Magellanic Clouds. The stunning wide-field results give scientists a peek at the hot young stars of these satellite galaxies, which hover around the Milky Way less than 200,000 light years away. The mosaics were assembled by astronomers at NASA and Pennsylvania State University using the space agency's Swift satellite. The images were unveiled last week at the American Astronomical Society meeting in Indianapolis. 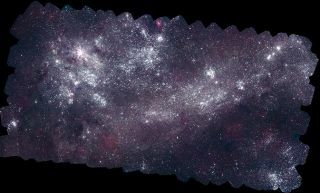 The Swift mosaic of the Small Magellanic Cloud contains about 250,000 ultraviolet sources. "Prior to these images, there were relatively few UV observations of these galaxies, and none at high resolution across such wide areas, so this project fills in a major missing piece of the scientific puzzle," Michael Siegel, lead scientist for Swift's Ultraviolet/Optical Telescope (UVOT), said in a statement. The Large Magellanic Cloud (LMC) is one-tenth the size of the Milky Way, and the Small Magellanic Cloud (SMC) is just half that size. But since both are relatively close to our own galaxy, they appear quite large — too large to fit in UVOT's field of view. That's why researchers needed thousands of images to cover both galaxies. The portrait of LMC, cobbled together from 2,200 snapshots, has a resolution of 160 megapixels and reveals about 1 million ultraviolet sources, according to a statement from NASA. The 57-megapixel mosaic image of the SMC, meanwhile, is made of 656 individual images and shows about 250,000 ultraviolet sources. Ultraviolet images allow astronomers to look at the hottest young stars and star-formation regions while blocking out older stars, mostly those more than 500 years old, which don't emit as much light at such higher energies. One particularly dazzling piece of the LMC portrait shows the Tarantula nebula, where powerful stellar winds from newborn stars create a spider-like shape. The images give a panoramic window into the evolution of stars in the SMC and LMC, which is impossible for astronomers to do for our own Milky Way since we are inside it, Stefan Immler, who led NASA's contribution to the project from the Goddard Space Flight Center in Greenbelt, Md., explained in a video from the space agency.